Other features of adhesives, e.g. additives for adhesives. This subclass is residual in respect of adhesive processes. Attention is drawn to the "References relevant to classification in this subclass (places in relation to which this subclass is residual)" section, below, for details of other places for classifying some adhesive processes. In cases where an adhesive contains an organic non-macromolecular compound but is not based on that compound, and such a compound is of interest, classification could be made in C08K or as an additive in C08J 3/00 or C09J 11/02. This may be in addition to classification in C09J 123/00-C09J 149/00. Processes for applying liquids or other fluent materials to surfaces in general are classified in B05D. Organic dyes or closely-related compounds for producing dyes, mordants or lakes per se, are classified in C09B. Treatment of inorganic materials other than fibrous fillers used as pigments or fillers are classified in C09C. Natural resins, French polish, drying-oils, driers, turpentine, per se, are classified in C09F. Polymers as such are classified in C08F or C08G. Polymers compositions are classified in C08L. Coating compositions or adhesive compositions are classified in C09D and C09J respectively. C09D and C09J are seen as "related fields" of C08L - this structure has implications on search and classification. if the claims pertain to a composition as such and to an adhesive (For example, "composition for use as an adhesive..."), both the C09J class and the corresponding C08L class are given. For searching both classes are to be searched, regardless of the wording of the claims, since in many documents of C08L, a passage relating to the use of the composition for an adhesive can be found. An adhesive composition with a polymer and organic or inorganic additives should be classified in C09J and C08K for the non-macromolecular component. Example: An adhesive composition containing polyethylene and amino-propyltrimethoxysilane is classified in groups C09J 123/06 and C08K 5/544. When two or more polymers are present in an adhesive composition, classification is given in the form of C-sets: the polymer in majority is given a C09J class (see below), and the minor components are characterised by Indexing Codes. The Indexing Codes are chosen from C08L or C08K and they may be linked or unlinked. The polymer in majority is always first in the C-set. Therefore at least one Indexing Code must always be present when more than one polymer is mentioned. Remark: Notes 2 and 4-6 relates to the combination classes which were in use before 2003 or from 09-2003 until 04-2012. In most places, the documents have not been reclassified. "Aliphatic radical" means an acyclic or a non-aromatic carbocyclic carbon skeleton which is considered to be terminated by every bond to: an element other than carbon; a carbon atom having a double bond to one atom other than carbon;an aromatic carbocyclic ring or a heterocyclic ring. Includes: natural or conjugated diene rubbers; orrubber in general (for a specific rubber, other than a natural rubber or a conjugated diene rubber, see the group provided for adhesives based on such macromolecular compounds). Adhesives based on inorganic constituents unless they are based on compositions of mortars, concrete, artificial stone or hydraulic cement. Any composition for adhesives able to be polymerized by means of the known methods and comprising at least one polymerisable ethylenically unsaturated monomer or oligomer. Polymerisable compositions for adhesives comprising at least one polymerisable monomer or oligomer comprising at least one carbon-carbon unsaturated bond and at least one macromolecular compound (a polymer) other than a polymer of groups C09D 159/00 - C09D 187/00. Adhesive processes characterised by process features, e.g. heating; Pre-treatment of the surface to be joined, e.g. by use of a primer; Separate application of adhesive ingredients to the different surfaces to be joined. Processes of debonding substrates which were glued together beforehand. Relationship between C09J 5/00 and C08J 5/12: Subgroups of C08J 5/12 are generally substrate-oriented subgroups, whereas subgroups of C09J 5/00 are generally process related subgroups. In this group Indexing Codes are used. To indicate the nature of the adhesive an Indexing Code of the type C09J 2400/00-C09J 2499/00 (only head-groups) is given. For example, for an (meth) acrylic adhesive the Indexing Code C09J 2433/00 should be given. To indicate the nature of the barrier layer an Indexing Code of the type M09J400/00B-C09J 2499/001 is given (B stands for barrier). For example, a barrier coating composition comprising a polyvinyl alcohol the Indexing Code C09J 2429/001 should be given. To indicate the nature of the primer coating composition an Indexing Code of the type M09J400/00P- C09J 2499/003 (P stands for primer) is given. For example, for a primer coating comprising an epoxy resin the Indexing Code C09J 2463/003 should be given. To indicate the nature of the substrate to be bonded an Indexing Code of the type M09J400/00S (S stands for substrate) is given. For example, for a substrate made of a polyolefin the Indexing Code C09J 2423/006 should be given. To indicate the nature of the pre-treated substrate to be bonded, irrelevant to what the pre-treatment might be, e.g. plasma or corona, an Indexing Code of the type M09J400/00T (T stands for pretreated) is given. For example, for a pre-treated polyolefin substrate the Indexing Code C09J 2423/008 should be given. To indicate a process of debonding the Indexing Code C09J 2205/302 is given. Applications and properties are indicated by the corresponding Indexing Codes of C09J 2203/00-C09J 2203/342 and C09J 201/00-C09J 2201/626. To indicate the nature of a second component in a system a combination of Indexing Codes of the above mentioned type is used. NB There is no order of the constituents according to their proportions. The codes are given in increasing numerical order. In order to indicate that the combination relates to a copolymer the corresponding Indexing Code C09J 2205/114 is given. In case of a blend composition the Indexing Code for a copolymer is not given. For example, for a substrate layer based on a blend of a polyolefin and a polyvinyl acetate the combination of Indexing Codes C09J 2423/006:C09J 2431/006 should be given. Additionally, for a substrate layer based on a copolymer of a polyolefin and a polyvinyl acetate the Indexing Code for the copolymer C09J 2205/114 should be given. Preparing the surfaces to promote bonding such as using a solvent. To indicate the nature of the pre-treated substrate to be bonded, irrelevant to what the pre-treatment might be, e.g. plasma or corona , an Indexing Code of the type M09J400/00T-C09J 2499/008 (T stands for pretreated) is given. For example, for a pre-treated polyolefin substrate the Indexing Code C09J 2423/008 should be given. Adhesive tapes, films or sheets characterised by having an outer adhesive layer to be applied to a substrate. 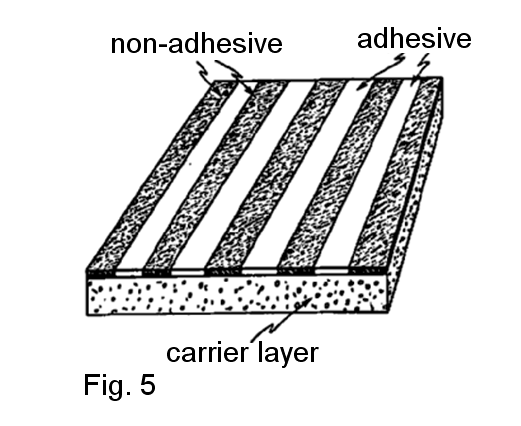 Said outer adhesive layer might be covered by a release liner or a release sheet (Fig.1). Adhesives in the form of films or foils without carriers. Adhesives in the form of films or foils on carriers, e.g. plastics, paper, textile fabrics, laminated material. Carriers with adhesive in the form of films or foils. Release liners of adhesives in the form of films or foils. Release coatings on the carrier. Primer between the carrier and the adhesive. 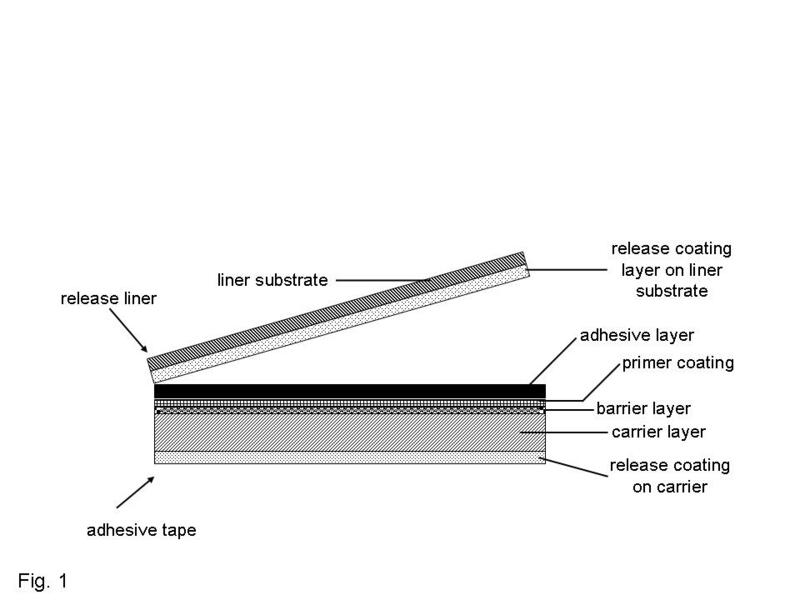 The figure shows a carrier mounted adhesive film with a barrier layer, a primer coating, a release coating on the carrier layer and a release liner. Subgroups of C09J 7/00 are generally chemistry-oriented subgroups, whereas subgroups of H01L 21/00 are generally process related subgroups. Relationship between C09J 7/00 and other groups of the subclass: Adhesives in the form of film or foils without a carrier layer and being specified by the macromolecular constituent are classified in C09J 101/00-C09J 201/00. In this main group, multi-aspect classification is applied, so that subject matter characterised by aspects covered by more than one of its subgroups should be classified in each of those groups. they relate to an application, e.g. stretch releasable tape. Properties and applications are indicated by the corresponding Indexing Codes of C09J 2203/00-C09J 2203/342 and C09J 201/00-C09J 2201/626. In many cases the classification of additional information, e.g. the type of adhesive is very useful for retrieving the document, and therefore very desirable. For example, if a document discloses an adhesive tape having a carrier and being characterised by an acrylic adhesive layer (covered by C09J 7/385), this document should also be classified in one of the subgroups of C09J 133/00. To indicate the nature of the adhesive an Indexing Code of the type C09J 2401/00 - C09J 2499/00 (only head-groups) is given. For example for an (meth)acrylic adhesive the Indexing Code C09J 2433/00 is given. To indicate the nature of the barrier layer an Indexing Code of the type C09J 2401/00 - C09J 2499/001 is given . For example for a barrier coating composition comprising a polyvinyl alcohol the Indexing Code C09J 2429/001 should be given. To indicate the nature of the primer coating composition an Indexing Code of the type C09J 2401/00 - C09J 2499/003 is given. For example for a primer coating comprising an epoxy resin the Indexing Code C09J 2463/003 should be given. To indicate the nature of the substrate of the adhesive tape an Indexing Code of the type C09J 2401/00- C09J 2499/006 is given. For example for a substrate made of a polyolefin the Indexing Code C09J 2423/006 should be given. Applications and properties are indicated by the corresponding Indexing Codes of C09J 2203/00-C09J 2203/342 and C09J 201/00-C09J 2201/626. For example the use of an adhesive tape for bundling cables should be indicated by the Indexing Code C09J 2203/302. The presence of an adhesive layer being formed by alternating adhesive areas being chemically different is indicated by the Indexing Code C09J 2201/40 (Fig. 2). In contrast, the presence of different adhesive layers opposing each other is indicated by the Indexing Code C09J 2201/134 (Fig. 3). In case the adhesive layer is interrupted by non-adhesive protrusions extending from the surface of the carrier layer, the Indexing Code C09J 2201/32 is given (Fig. 4). In case the adhesive coating being discontinuous, the Indexing Code C09J 2201/28 is given (Fig. 5). To indicate the presence of an additive in the adhesive or substrate layer the corresponding Indexing Codes C09J 2205/102 and C09J 2205/106 are given. To indicate the nature of the non-macromolecular additive an Indexing Code of the type C08K 3/00-C08K 13/08 is given. For example for an adhesive layer of the adhesive tape comprising an inorganic flame proofing agent the Indexing Code C08K 3/016 may be given as well as the Indexing Code indicating the presence of an additive in the adhesive layer. In order to indicate that the second component relates to a copolymer, the corresponding Indexing Code C09J 2205/114 for should be given. In case of a blend composition the Indexing Code for a copolymer is not given. For example: For a substrate layer based on a blend of a polyolefin and a polyvinyl acetate the combination of Indexing Codes (C09J 2423/006, C09J 2431/006) should be given. Additionally, for a substrate layer based on a copolymer of a polyolefin and a polyvinyl acetate the Indexing Code for the copolymer C09J 2205/114 is given. The subgroups of C09J 7/40 cover release liners used to cover the adhesive surface of an adhesive tape as illustrated in Fig. 1. Release coating layers being part of the adhesive tape (cf. Fig. 1) itself are classified in C09J 7/203, C09J 7/22 and C09J 7/203, C09J 7/21. This subgroup is given where the release coating composition is applied to the carrier layer (cf. Fig. 1). This subgroup is given for adhesive tapes having a carrier constituted by a laminate. The presence of a foam, metal, paper, textile or other material layer in the laminate is indicated by the corresponding Indexing Code of C09J 2400/00. The presence of only resin layers in the laminate is indicated by the Indexing Code C09J 2201/162. In general, the nature of the resin in the laminate support layer is indicated by the corresponding Indexing Code of C09J 2401/00 - C09J 2499/006. For example for a laminate carrier comprising a layer made of a polyolefin the Indexing Code C09J 2423/006 should be given. Adhesive tape with a laminate carrier having a textile fabrics or paper layer are NOT classified in the subgroups of C09J 7/21. The presence of a barrier layer, a release coating layer or of a primer layer does not constitute a laminate carrier layer. These layers are considered forming part of the carrier layer (cf. Fig. 1) . 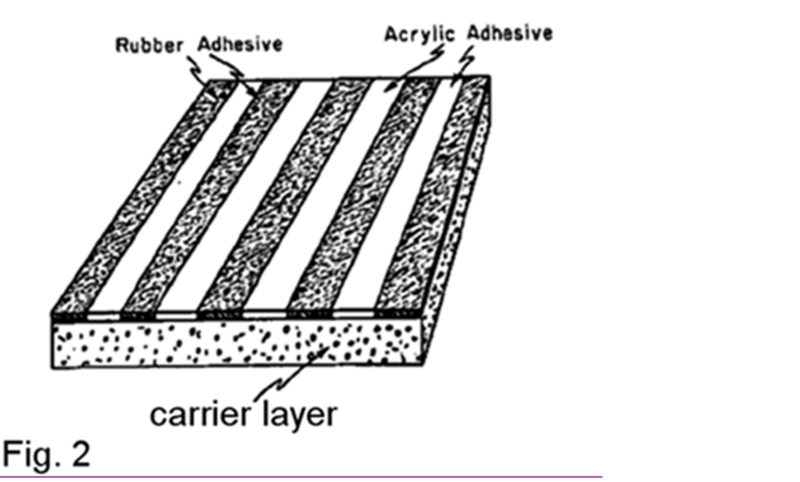 In contrast, a carrier layer being coated with an ink receptive layer is considered as a laminate support layer. Subgroups of C09J 7/21 are given to adhesive tapes having a carrier made of paper or textile fabrics. In order to indicate whether a paper or a textile fabrics carrier layer is present the corresponding Indexing Code of C09J is given. Laminate carrier layers comprising a layer made of paper of textile fabrics are NOT classified in the subgroups of C09J 7/21, instead laminated carriers are classified in the subgroup of C09J 7/29. This subgroup is given where the release coating composition is applied to the paper or textile fabrics carrier layer. (cf. Fig. 1). Pressure-sensitive adhesive (PSA, self-adhesive, self-stick adhesive) is adhesive which forms a bond when pressure is applied to adhere the adhesive with the adherend. No solvent, water, or heat is needed to activate the adhesive. Metallised plastics are plastics coated with a thin layer of metal, usually aluminium. Metallisation is generally performed using physical vapour deposition, plating or thermal/cold spraying processes. This coating is much thinner than a metal foil could be made, in the range of 0.5 micrometres. Heat-activated adhesives are designed to bond parts or components through the use of heat (over 50 ℃). "carrier", "support", "substrate", "facestock" or "backing"
"adhesive", "glue", "fixative", "bonding agent" or "sealant"
Covalently or ionically crosslinked gels are classified in C08B as they are considered as polysaccharide derivatives per se. A composition based on cellulose, modified cellulose or cellulose derivatives is classified in C08L. Coating compositions based on cellulose, modified cellulose or cellulose derivatives are classified in C09D following the same rules as mentioned in the note for C08L. Please refer to the comments provided for C08B, as well as for the corresponding C08B main group. Adhesive compositions of cellulose or derivatives thereof in solution, together with other macromolecular compounds, or together with an inorganic or non-macromolecular organic additive are considered as an adhesive composition and are thus classified according to the rules of C09J. They are classified according to the mutual proportions by weight of only the macromolecular constituents, in particular according to the macromolecular constituent present in the highest proportion. If all the constituents are present in equal proportions, the composition is classified according to each of these constituents. Adhesive compositions containing a cellulose and an inorganic or non-macromolecular organic additive as compounding agent are not classified in C08K , but in the C09J subclass together with the corresponding Indexing Code(s) in C08K. Example 1: Adhesive composition of cellulose acetate in solution is classified in C09J 101/12. Example 2: An adhesive composition consisting of 60 wt% of microcrystalline cellulose and 40 wt.% of maltodextrin is classified in (C09J 101/04, C08L 3/02). Last place priority rule: Within each group of this subclass, in the absence of an indication to the contrary, classification is made in the last appropriate place. The subject-matter disclosed in both the claims and the examples of a patent document is to be classified. A composition based on starch or derivatives thereof is classified in C08L. Coating compositions based on such starches are classified in C09D following the same rules as mentioned in the note for C08L. Adhesive composition of starch or derivatives thereof in solution, together with other macromolecular compounds, or together with an inorganic or non-macromolecular organic additive are considered as an adhesive composition and are thus classified according to the rules of C09J. They are classified according to the mutual proportions by weight of only the macromolecular constituents, in particular according to the macromolecular constituent present in the highest proportion. If all the constituents are present in equal proportions, the composition is classified according to each of these constituents. Adhesive compositions containing a starch and an inorganic or non-macromolecular organic additive as compounding agent are not classified in C08K, but in the C09J subclass together with the corresponding Indexing Code(s) in C08K. A composition based on such polysaccharides or derivatives thereof is classified in C08L. Coating compositions based on such polysaccharides are classified in C09D following the same rules as mentioned in the note for C08L. Adhesive compositions of polysaccharides or derivatives thereof in solution, or together with other macromolecular compounds, or together with an inorganic or non-macromolecular organic additive are considered as a composition and are thus classified according to the rules of C09J. They are classified according to the mutual proportions by weight of only the macromolecular constituents, in particular according to the macromolecular constituent present in the highest proportion. If all the constituents are present in equal proportions, the composition is classified according to each of these constituents. Compositions containing a polysaccharide and an inorganic or non-macromolecular organic additive as compounding agent are not classified in C08K, but in the C09J subclass together with the corresponding Indexing Code(s) in C08K. Example 1: Adhesive composition of ethers of cyclodextrin in solution is classified in C09J 105/16. Example 2: An adhesive composition consisting of 60 wt% of hyaluronic acid and 40 wt.% of maltodextrin is classified in (C09J 105/08, C08L 3/02). Adhesive compositions of natural rubbers or latex. Adhesive compositions of homopolymers or copolymers of chloroprene or latex. 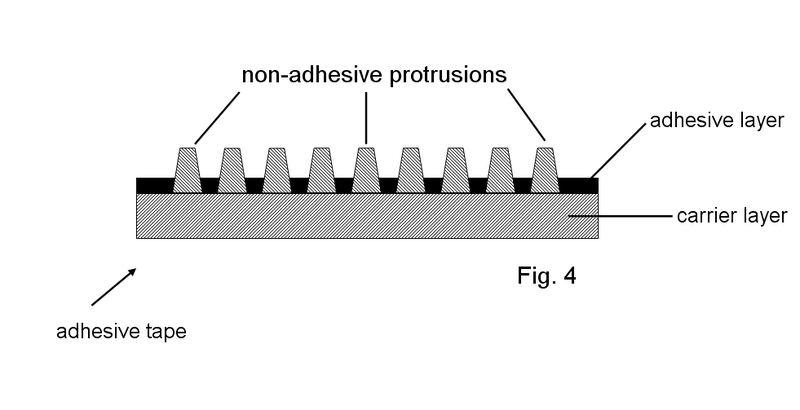 Adhesive compositions of rubbers containing carboxyl groups containing monomers in minority, e.g. acrylic acid or acrylic acid esters. Rubber derivate means a rubber treated according to C08C. An Indexing Code C08C may be given for the treatment. Groups C09J 111/00 and C09J 113/00 take precedence over C09J 115/00. Reclaimed rubber means reuse of unvulcanised or devulcanised rubber. Adhesive compositions containing rubbers with functional groups, e.g. telechelic diene rubbers which are classified in C09J 119/006. Polymerisation of diene polymers is classified in C08F 36/00, C08F 136/00 or C08F 236/00. Treatment or chemical modification of diene rubber is classified in C08C 1/00 - C08C 19/44. Preparation of polymer compositions is classified in C08J 3/20 - C08J 3/22. In the absence of an indication to the contrary, classification is made in the last appropriate place. Adhesive compositions are classified according to the macromolecular constituent or constituents present in the highest proportion: if all these constituents are present in equal proportions the composition is classified according to each of these constituents. After the notation of C09J 107/00 - C09J 121/02, classification is given in the form of C-sets: the polymer in majority is given a C09J class, and the minor components are characterised by Indexing Codes. The Indexing Codes are chosen from C08L or C08K and they may be linked or unlinked. The polymer in majority is always first in the C-set. Inorganic or non-macromolecular organic materials as compounding agents are classified in C08K; Adhesive compositions classified in C08K according to note 3 of C08K, are not classified in C09J. However, if an adhesive composition contains two polymers and an additive following C08K, classification is made in C09J and an Indexing Code from C08K will be given. a: An adhesive composition comprising a blend of 60 parts polybutadiene (C09J 109/00) and 40 parts polyamide (C09J 177/00) is classified in (C09J 109/00, C08L 77/00). b: An adhesive composition comprising a blend of 50 parts polybutadiene (C09J 109/00) and 50 parts polyamide (C09J 177/00) is classified in (C09J 109/00, C08L 77/00) and (C09J 177/00, C08L 9/00). c: An adhesive composition comprising a blend of 60 parts polybutadiene (C09J 109/00), 40 parts natural rubber (C09J 107/00) and 40 parts of silica is classified in (C09J 109/00, C08L 7/00 , C08K 3/36). Adhesive compositions of rubbers not provided for in groups C09J 107/00-C09J 119/02. The main Group C09J 123/00 should not be used. Copolymers get the class of the major component, except if there is a lower class which specifies the comonomer in minority (see also last place rule), e.g. ethylene butene copolymers (ethylene comonomer in majority) would be classified in C09J 123/0815, and not in C09J 123/20, but ethylene butene copolymers (butene in majority) would be classified in C09J 123/20, not in C09J 123/0815. If there are several possibilities to classify, the lowest alternative classification (last place) is used. To indicate the nature of the second component in a system, classification is given in the form of C-sets as mentioned above. Remark: Note 2 after the title is not relevant for C09J 123/00. All documents from before 2003 are reclassified. a. An adhesive of a blend of 60 parts polyethylene (C09J 123/06) and 40 parts polyamide (C09J 177/00) is classified in (C09J 123/06, C08L 77/00). b. An adhesive of a blend of 50 parts polyethylene (C09J 123/06) and 50 parts polyamide (C09J 177/00) is classified in (C09J 123/06, C08L 77/00) and (C09J 177/00, C08L 23/06). c. An adhesive based on a composition of polyethylene and containing CaCO3 is classified in C09J 123/06 and C08K 3/26. If this composition contains also a polyamide, then the classification will be (C09J 123/06, C08L 77/00, C08K 3/26). d. An adhesive based on a composition based on a first polyethylene (C09J 123/06) and containing a second polyethylene, a phenol and silica is classified in (C09J 123/06, C08L 23/06, C08K 5/13, C08K 3/36) and C08L 2205/02. e. An adhesive based on a composition containing a polyamide in majority, a polyester and a polyethylene is classified in (C09J 177/00, C08L 67/00, C08L 23/06) and C08L 2205/03. f. Adhesives of compositions containing two polymers of the same subgroup, for example compositions of two ethylene vinylacetate copolymers, are characterised by the Indexing Code C08L 2205/025. The complete classification for such a compositions therefore would be (C09J 123/0853, C08L 23/0853) and C08L 2205/025. The same applies for compositions of two polymers only distinguished by physical properties, e.g. molecular weight or density. All Indexing Codes of C08L (for secondary or polymers in minority, properties, uses, applications) and C08K (for inorganic or organic non-macromolecular additives) are used. Documents are preferably classified according to the examples in the documents, not according to general claims, e.g. if the examples only describe adhesives based on polyethylene, but subject matter of the claim is a adhesive of polyolefin, the document is classified under adhesives of polyethylene (C09J 123/06, C08L--/--). In C09J, adhesives are classified which have only one polymeric component are also classified, e.g. C09J 123/0815 represents an adhesive of only one ethylene vinylacetate polymer. Polymers in which unsaturated monomer molecules join together to form a polymer in which the molecular formula of the repeat unit is identical (except for the double bond) with that of the monomer. Polymers formed by polymerization of monomers on to a macromolecule having groups capable of inducing the formation of new polymer chains bound at one or both ends of the starting macromolecule, or by polymerization using successively different catalyst types or successively different monomer systems without deactivating the intermediate polymer. Polymers in which water or some other simple molecule is eliminated from 2 or more monomer molecules as they combine to form the polymer or crosslinks between polymer chains. Usually denotes a polymer of 2 chemically distinct monomers, and sometimes denotes a terpolymer containing more than 2 types of monomer unit. Macromolecular compounds obtained by polymerizing monomers on to preformed polymers or on to inorganic materials. Such preformed polymers could be rubbers, polysaccharides, condensation polymers, homopolymers or copolymers of the addition polymer type. Polymers resulting from the polymerisation of a single monomer or polymer with a single type of repeating unit. Attention is drawn to the table at the beginning of C09J. This group should only be used in cases without examples. This group should only be used if there are examples both of polymers of C09J 123/06 or C09J 123/0807 and C09J 123/0846. This group can be further characterised by the Indexing Codes C08L 2207/062, C08L 2207/066, C08L 2207/068, C08L 2207/07 or C08L 2314/02-C08L 2314/08. This group should only be used if there are examples both of polymers of C09J 123/0807 and C09J 123/0846. C09J 123/16 takes precedence over this group. This group can be further characterised by Indexing Codes C08L 2207/062-C08L 2207/07 or C08L 2314/02-C08L 2314/08. It is preferable to classify in C09J 123/0815. The polymers in this group can be further characterised by Indexing Codes C08L 2207/062-C08L 2207/07 or C08L 2314/02-C08L 2314/08. When ethylene is in majority, ethylene-propene copolymers are only classified when propene is clearly the minor component, e.g. LLDPE with the comonomer propene is classified in C09J 123/0815, whereas EPR is classified in C09J 123/16. Adhesive compositions of copolymers of ethene with aliphatic cyclic olefins, e.g. ethylene, propene and norbornene. This group takes precedence over C09J 123/0815, e.g. a copolymer of ethylene, propene and norbornene. Copolymers with majority of norbornene see C09J 145/00. Adhesive compositions of copolymers of ethene with aliphatic polyenes, i.e. containing more than one unsaturated bond, e.g. a copolymer of ethylene, butene (small amount) and norbornene (smaller amount). This group takes precedence over C09J 123/0815. Adhesive compositions of copolymers of ethene with aromatic monomers, e.g. copolymer of ethylene, butene (small amount) and styrene (smaller amount). Adhesive compositions of copolymers of ethene with unsaturated hydrocarbons containing other atoms than carbon or hydrogen atoms, e.g. copolymer of ethylene, butene (small amount) and acrylate (smaller amount). Adhesive compositions of saponified vinylacetate (EVA), e.g. copolymer of ethylene, vinylacetate (small amount) and vinylalcohol (smaller amount). This group takes precedence over C09J 123/0861. Adhesive compositions of ethene with acids or derivatives thereof, e.g. ethylene copolymers with vinyl sulfonic acids. C09J 123/0892 takes precedence over this group. Ethylene carboxylic acid copolymers where H+ is replaced by M+. This group takes precedence over C09J 123/0892. In this group, M+ is not regarded as "other atom". Adhesive compositions of ethene with epoxide containing esters, e.g. ethylene copolymers with glycidyl methacrylate. This group takes precedence over C09J 123/0869. This group can be further characterised by Indexing Codes C08L 2207/10-C08L 2207/14 or C08L 2314/02-C08L 2314/08. Adhesive compositions of copolymers of propene, when the propene is in majority, e.g. ethylene-propene copolymers when ethylene is clearly the minor component. Rubbery polymers, e.g. high a-olefin content or atactic, but no propene. This group takes precedence over C09J 123/14 or C09J 123/142 in the case of terpolymers even if the polyene unit is the monomer in the lowest concentration. This group takes preference over C09J 123/14 or C09J 123/142 in the case of terpolymers even if the heteroatom carrying unit is the monomer in the lowest concentration. Adhesives based on elastomeric ethene-propene or ethene-propene-diene copolymers, e.g. EPR and EPDM rubbers or polymers comprising both ethylene and propylene on about the same amount. This group takes precedence over C09J 123/0815 and C09J 123/14. Although these polymers are rubbers or elastomers, C08L 23/00 or subgroups are used if they not in majority. C09J 123/0861 takes precedence in the case of saponified EVA. C09J 123/0876 takes precedence in the case of neutralised ethylene carboxylic acid copolymers (iononers). For chlorosulfonation, C09J 123/32 takes precedence over this group. Use of general classes should be avoided by classifying the specific examples, whenever practicable. For example, a document claiming adhesive compositions of a polymer of an aromatic vinyl monomer, wherein the examples are limited to e.g. polystyrene, should receive the class C09J 125/06 and not C09J 125/04, C09J 125/02 or C09J 125/00. General purpose PS, GPS is classified in C09J 125/06. High impact polystyrene HIPS is classified in C09J 125/06, unless the rubber or rubber content is of relevance, where it should be classified in C09J 151/04. For example, a document claiming adhesive compositions of a fluorinated polymer, wherein the examples are limited to e.g. poly(tetrafluoroethylene), should be classified in C09J 127/18 and not in C09J 127/12. Adhesives based on (co)polymers of fluorine containing unsaturated monomers other than those covered by C09J 127/14-C09J 127/20. Adhesives based on partially hydrolysed homopolymers or copolymers of esters of unsaturated alcohols with saturated carboxylic acids, e.g. copolymers of allyl alcohol. For example, a document claiming adhesive compositions of a polymer of an unsaturated alcohol monomer, wherein the examples are limited to e.g. polyvinyl alcohol, should be classified in C09J 129/04 and not in C09J 129/02 or C09J 129/00. Saponified or hydrolysed (co)polymers of vinyl esters of saturated acids, e.g. saponified or hydrolysed (co)polymers of vinyl acetate. Copolymers with styrene, even when styrene is in majority. C09J 135/08 takes precedence over this group, i.e. copolymers with monomers according to C09J 135/08, e.g. unsaturated dicarboxylic acids, anhydrides or esters, are classified in C09J 135/08 only, even when these monomers are in minority. esters of polycarboxylic acids, e.g. of phthalic acid. The use of general classes should be avoided by classifying the specific examples, whenever practicable. For example, a document claiming Adhesive compositions of a (co)polymer of an unsaturated ester of a saturated carboxylic acid monomer, wherein the examples are limited to e.g. polyvinyl acetate, should receive the class C09J 131/04 and not C09J 131/02 or C09J 131/00. Adhesive compositions of homopolymers or copolymers having one or more unsaturated aliphatic radicals, each having only one carbon-to-carbon double bond, and at least one being terminated by only one carboxyl radical, or of salts, anhydrides, esters, amides, imides, or nitriles thereof, e.g. acrylamide, methacrylamide or acrylic acid esters. The main groups of C09J 133/00 should not be used for classification. If C09J 133/00 relates to composition of two or more polymers, classification is given as follows: the polymer in majority is given a C09J class (see above), and the minor components are characterised by C-Sets and Indexing Codes. In the case that several polymers can be in majority, several C09J classes for the polymers which are possibly in majority and the Indexing Codes of C08L for all polymers in minority and additives are given. The classification of the main component polymer of the adhesive should be according to the most specific, or reactive monomer (i.e. glycidyl methacrylate and not methyl methacrylate in a copolymer of glycidyl methacrylate and methyl methacrylate). All comonomers of the main polymeric component should be characterised by their Indexing Codes in C08F (C08F 2220/325 and C08F 220/14. Remark: Note 2 is relevant for C09J 133/00. Documents from before 2003 are not reclassified. a. An adhesive composition of 60 parts polymethyl methacrylate (C09J 133/12) and 40 parts polyamide (C08L 77/00) is classified in (C09J 133/12, C08L 77/00). b. An adhesive composition of 50 parts polymethyl methacrylate (C09J 133/12) and 50 parts polyamide (C09J 177/00) is classified in (C09J 133/12, C08L 77/00) and (C09J 177/00, C08L 33/12). c. An adhesive composition based on polymethyl methacrylate and containing CaCO3 is classified in C09J 133/12 and C08K 3/26. If this composition contains also a polyamide, then the classification will be (C09J 133/12, C08L 77/00, C08K 3/26). d. An adhesive composition based on a first polymethyl methacrylate (C09J 133/12) and containing as a second polymer a copolymer of acrylic acid, a phenol and silica is classified in (C09J 133/12, C08L 33/02, C08K 5/13, C08K 3/36) and C08L 2205/02. e. A composition containing a polyamide in majority, a polyester and a polymethyl methacrylate is classified in (C09J 177/00, C08L 67/00, C08L 33/12) and , C08L 2205/03. f. Adhesive compositions containing two polymers of the same .dot group, for example compositions of two polymers am hydroxyl containing acrylic ester, are characterised by the Indexing Code C08L 2205/025. The complete classification for such a compositions therefore would be (C09J 133/066, C08L 33/066 ) and C08L 2205/025. The same applies for compositions of two polymers only distinguished by physical properties, e.g. molecular weight or density. All Indexing Codes of C08L (for secondary or polymers in minority, properties, uses, applications), C08K (for inorganic or organic non-macromolecular additives) and C08F are used. An adhesive composition containing next to another addition polymer a main component of a copolymer of acrylic ester, acrylamide and hydroxymethylmethacrylate therefore would be classified in C09J 133/26, C08F 220/10 and C08F 220/26, even if less acrylamide monomer is present than acrylic ester and hydroxymethylmethacrylate. 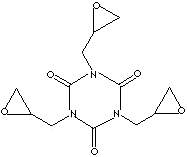 If this main component would be in a blend with methylmethacrylate copolymer, an Indexing Code (C09J 133/26, C08L 33/12) would additionally be given. Documents are preferably classified according to the examples in the documents, not according to general claims, e.g. if the examples only describe adhesives of acrylic copolymers, but subject matter of the claim is a composition of acrylamide copolymer, the document is classified as adhesive of acrylamide copolymers (C09J 133/26, C08L 23/00). In C09J, adhesives which have only one polymeric component are classified, e.g. C09J 133/08 represents an adhesive of only one acrylic ester polymer. Attention is drawn to the glossary of C09J 123/00. Attention is drawn to the table after the title of C09J. All of C09J 137/00-C09J 143/04, C09J 133/064-C09J 133/068 and C09J 133/14-C09J 133/26 take precedence over this group, even if the corresponding monomers are in minority. This group should be used if the nature of the acrylic ester polymer is not specified. Adhesive compositions based on all alkyl alkylacrylate monomers. Acrylic adhesive compositions based on maleic acid or derivative containing polymers having maleic acid in minority. Adhesive compositions based on polymers containing hydroxyethyl methacrylate (HEMA). Adhesive compositions based on polymers containing glycidyl methacrylate. Adhesive composition based on homopolymers or copolymers which are esters of acrylic acid or methacrylic acid. All of C09J 137/00-C09J 143/00, C09J 133/062-C09J 133/068 and C09J 133/14-C09J 133/26 take precedence over this group even if the corresponding monomers are in minority. In copolymers, all of C09J 137/00-C09J 143/04, C09J 133/062-C09J 133/068 and C09J 133/14-C09J 133/26 take precedence over this group even if the corresponding monomers are in minority. Adhesive compositions based on acrylic esters of polyethylene ethers, methoxymethacrylate or amino substituted acrylate esters. All of C09J 133/064-C09J 133/068, C09J 137/00-C09J 143/00 and C09J 133/18-C09J 133/26 take precedence over this group. Adhesives based on homopolymers or copolymers of compounds having one or more unsaturated aliphatic radicals, each having only one carbon-to-carbon double bond, and at least one being terminated by a carboxyl radical, and containing at least another carboxyl radical in the molecule, or of salts, anhydrides, esters, amides, imides or nitriles thereof; Adhesives based on derivatives of such polymers. Bonding using organic-inorganic elastomer and elastomeric substances obtained by co-polymerisation of maleic anhydride, vinyl stearate and a vinyl alkoxy silane with or without vinyl formate. Remark: Note 2 is relevant for C09J 135/00. Documents from before 2003 are not reclassified. a. An adhesive of a blend of 60 parts styrene-maleic anhydride copolymer (C09J 135/06) and 40 parts polyamide (C09J 177/00) is classified in (C09J 135/06, C08L 77/00). b. An adhesive of a blend of 50 parts styrene-maleic anhydride copolymer (C09J 135/06) and 50 parts polyamide (C09J 177/00) is classified in (C09J 135/06, C08L 77/00 ) and (C09J 177/00, C08L 35/06). c. An adhesive of a composition based on styrene-maleic anhydride copolymer and containing CaCO3 is classified in C09J 135/06 and gets an Indexing Code of C08K, e.g. in C08K 3/26. If this composition contains also a polyamide, then the classification will be (C09J 135/06, C08L 77/00, C08K 3/26). d. An adhesive of a composition based on a first styrene-maleic anhydride copolymer (C09J 135/06) and containing a second styrene-maleic anhydride copolymer, a phenol and silica is classified in (C09J 135/06, C08L 35/06, C08K 5/13, C08K 3/36) and C08L 2205/025. e. An adhesive of a composition containing a polyamide in majority, a polyester and a styrene-maleic anhydride copolymer is classified in (C09J 177/00, C08L 67/00, C08L 35/06) and C08L 2205/03. f. An adhesive of compositions containing two polymers of the same .dot group, for example compositions of two styrene-maleic anhydride copolymer polymers, are characterised by the Indexing Code C08L 2205/025. The complete classification for such compositions therefore would be (C09J 135/06, C08L 35/06) and C08L 2205/025. The same applies for adhesive compositions of two polymers only distinguished by physical properties, i.e. molecular weight or density. All Indexing Codes of C08L (for secondary or polymers in minority, properties, uses, applications), C08K (for inorganic or organic non-macromolecular additives) and C08F (for specific monomers) are used. Indexing Codes of C08F are used for specific monomers, which are part of the copolymer classified in C09J 135/00. Therefore a terpolymer of styrene, maleic anhydride and acrylic amide should additionally be characterised by an Indexing Code C08F 220/56. Documents are preferably classified according to the examples in the documents, not according to general claims, e.g. if the examples only describe adhesives of compositions of styrene-maleic anhydride, but subject matter of the claim is an adhesive of a composition of a vinyl aromatic copolymer, the document is classified as adhesive composition of styrene maleic anhydride copolymer (C09J 135/06, C08L 23/00). In C09J,adhesives which have only one polymeric component is also classified, e.g. C09J 135/06 for an adhesive of only one maleic anhydride copolymer. Maleic anhydride should be characterised by an Indexing Code of C08F, e.g. C08F 222/04. Groups C09J 135/06 and C09J 135/08 take precedence over this group. Maleic anhydride should be characterised by an Indexing Code of C08F , e.g. C08F 222/04. Remark: Note 2 is relevant for C09J 137/00. Documents from before 2003 are not reclassified. Common adhesive ingredients like tackifying resins or waxes do only get a C-Set classification in C09J 137/00 if they have characterising features for the composition. a. An adhesive of a blend of 60 parts diene vinylfuran copolymer (C09J 137/00) and 40 parts polyamide (C09J 177/00) is classified in (C09J 137/00, C08L 77/00). b. An adhesive of a blend of 50 parts diene vinylfuran copolymer (C09J 137/00) and 50 parts polyamide (C09J 177/00) is classified in (C09J 137/00, C08L 77/00) and (C09J 177/00, C08L 37/00). c. An adhesive of a composition based on diene vinylfuran copolymer and containing CaCO3 is classified in C09J 137/00 and gets an Indexing Code of C08K, e.g. in C08K 3/26. If this composition contains also a polyamide, then the classification will be (C09J 137/00, C08L 77/00, C08K 3/26). d. An adhesive of a composition based on a first diene vinylfuran copolymer (C09J 137/00) and containing a second diene vinylfuran copolymer, a phenol and silica is classified in (C09J 137/00, C08L 37/00, C08K 5/13, C08K 3/36) and C08L 2205/025. e. An adhesive of a composition containing a polyamide in majority, a polyester and a diene vinylfuran copolymer is classified in (C09J 177/00, C08L 67/00, C08L 37/00) and C08L 2205/03. f. An adhesive of compositions containing two polymers of the same .dot group, for example compositions of two diene vinylfuran copolymer polymers, are characterised by the Indexing Code C08L 2205/025. The complete classification for such compositions therefore would be (C09J 137/00, C08L 37/00) and C08L 2205/025. The same applies for adhesive compositions of two polymers only distinguished by physical properties, e.g. molecular weight or density. Indexing Codes of C08F are used for specific monomers, which are part of the copolymer classified in C09J 137/00. Therefore a terpolymer of diene, maleic anhydride and vinyl furan should additionally be characterised by an Indexing Codes C08F 222/00 and C08F 236/06. Documents are preferably classified according to the examples in the documents, not according to general claims, e.g. if the examples only describe adhesives of compositions of diene vinylfuran copolymers, but subject matter of the claim is an adhesive of a composition of a diene copolymer, the document is classified as adhesive composition of a vinyl furan copolymer (C09J 137/00, C08L--/--). Attention is drawn to the the glossary of C09J 123/00. In C09J 139/00, adhesives do not get the class of the major component of the monomer of the copolymers. An adhesive based on a copolymer of acrylic ester and vinyl pyridine, which has a lower content of vinyl pyridine than acrylic ester, would also be classified in C09J 139/08. Additional classification in C09J 133/08 should be considered. The comonomer in majority should get an Indexing Code in C08F (C08F 220/10 for acrylic esters). Remark: Note 2 is not relevant for C09J 139/00. All documents from before 2003 are reclassified. a. An adhesive of a blend of 60 parts vinyl pyridine copolymer (C09J 139/08) and 40 parts polyamide (C09J 177/00) is classified in (C09J 139/00, C08L 77/00). b. An adhesive of a blend of 50 parts vinyl pyridine copolymer (C09J 139/08) and 50 parts polyamide (C09J 177/00) is classified in C09J 139/08, C08L 77/00) and (C09J 177/00, C08L 39/08). c. An adhesive based on a composition of vinyl pyridine copolymer and containing CaCO3 is classified in C09J 139/08 and C08K 3/26. If this composition contains also a polyamide, then the classification will be (C09J 139/08, C08L 77/00, C08K 3/26). d. An adhesive based on a composition based on a first vinyl pyridine copolymer (C09J 139/08) and containing a second vinyl pyridine copolymer, a phenol and silica is classified in (C09J 139/08, C08L 39/08, C08K 5/13, C08K 3/36) and C08L 2205/025. e. An adhesive based on a composition containing a polyamide in majority, a polyester and a vinyl pyridine copolymer is classified in (C09J 177/00, C08L 67/00, C08L 39/08) and C08L 2205/03. A copolymer of acrylic ester, maleic anhydride and vinyl pyrrolidone used in an adhesive therefore would be classified in C09J 139/06, C08F 220/10 and C08F 222/06. Documents are preferably classified according to the examples in the documents, not according to general claims, e.g. if the examples only describe adhesives based on an acrylic polymer containing vinyl pyrrolidone, but subject matter of the claim is an acrylic adhesive, the document is classified under adhesives of vinyl pyrrolidone copolymer (C09J 139/06, C08L--/--). In C09J, adhesives which have only one polymeric component are classified, e.g. C09J 139/06 represents an adhesive of only one vinyl pyrrolidone copolymer. Adhesive compositions based on homopolymers or copolymers of compounds corresponding to groups C08F 30/00, C08F 130/00 or C08F 230/00. In C09J 143/00, adhesives do not get the class of the major component of the monomer of the copolymers. An adhesive based on a copolymer of acrylic ester and vinyl silane, which has a lower content of vinyl silane than acrylic ester, would also be classified in C09J 143/04. Additional classification in C09J 133/08 should be considered. The comonomer in majority should get an Indexing Code in C08F (C08F 220/10 for acrylic esters). Remark: Note 2 is not relevant for C09J 143/00. All documents from before 2003 are reclassified. a. An adhesive of a blend of 60 parts vinyl silane copolymer (C09J 143/04) and 40 parts polyamide (C09J 177/00) is classified in (C09J 143/04, C08L 77/00). b. An adhesive of a blend of 50 parts vinyl silane copolymer (C09J 143/04) and 50 parts polyamide (C09J 177/00) is classified in (C09J 143/04, C08L 43/04) and (C09J 177/00, C08L 43/04). c. An adhesive based on a composition of vinyl silane copolymer and containing CaCO3 is classified in C09J 143/04 and C08K 3/26. If this composition contains also a polyamide, then the classification will be (C09J 143/04, C08L 77/00, C08K 3/26). d. An adhesive based on a composition based on a first vinyl silane copolymer (C09J 143/04) and containing a second vinyl silane copolymer, a phenol and silica is classified in (C09J 143/04, C08L 43/04, C08K 5/13, C08K 3/36) and C08L 2205/025. e. An adhesive based on a composition containing a polyamide in majority, a polyester and a vinyl silane copolymer is classified in (C09J 177/00, C08L 67/00, C08L 43/04) and C08L 2205/03. Adhesive compositions based on copolymers of ethylene or propene are not classified in this group. Adhesive compositions based on homopolymers or copolymers of compounds corresponding to groups C08F 32/00, C08F 132/00, C08F 232/00 or C08F 244/00. Adhesive compositions based on (co)polymers of cyclic olefins, e.g. norbornene or bicyclopentadiene, where the cyclic monomer is the major component in the copolymer. Copolymers get the class of the major component, except if there is a lower class which specifies the comonomer in minority (see also last place rule), i.e. ethylene copolymers (ethylene comonomer in majority) would be classified in C09J 123/0807, and not in C09J 145/00, but ethylene norbornene copolymers (norbornene in majority) would be classifed in C09J 145/00, not in C09J 123/08. Remark: Note 2 is not relevant for C09J 145/00. All documents from before 2003 are reclassified. a. An adhesive of a blend of 60 parts poly-norbornene (C09J 145/00) and 40 parts polyamide (C09J 177/00) is classified in (C09J 145/00, C08L 77/00). b. An adhesive of a blend of 50 parts poly norbornene (C09J 145/00) and 50 parts polyamide (C09J 177/00) is classified in (C09J 145/00, C08L 77/00) and (C09J 177/00, C08L 45/00). c. An adhesive based on a composition of polynorbornene and containing CaCO3 is classified in C09J 145/00 and C08K 3/26. If this composition contains also a polyamide, then the classification will be (C09J 145/00, C08L 77/00, C08K 3/26). d. An adhesive based on a composition based on a first polynorbornene (C09J 145/00) and containing a second polynorbornene, a phenol and silica is classified in (C09J 145/00, C08L 45/00, C08K 5/13, C08K 3/36) and C08L 2205/02. e. An adhesive based on a composition containing a polyamide in majority, a polyester and a polynorbornene is classified in (C09J 177/00, C08L 67/00, C08L 45/00) and C08L 2205/03. f. Adhesives of compositions containing two polymers of the same .dot group, for example compositions of two polynorbornenes, are characterised by the Indexing Code C08L 2205/025. The complete classification for such a compositions therefore would be (C09J 145/00, C08L 45/00) and C08L 2205/025. The same applies for compositions of two polymers only distinguished by physical properties, e.g. molecular weight or density. Documents are preferably classified according to the examples in the documents, not according to general claims, e.g. if the examples only describe adhesives based on polynorbornene, but subject matter of the claim is a adhesive of polyolefin, the document is classified under adhesives of polynorbornene (C09J 145/00, C08L--/--). Attention is drawn to the table of the glossary of C09J 123/00. Adhesive compositions of homopolymers or copolymers of compounds having one or more unsaturated aliphatic radicals, at least one having two or more carbon-to-carbon double bonds, i.e. unconjugated dienes. Adhesive compositions of derivatives of such polymers. C09J 145/00 takes precedence over C09J 147/00. After the notation of C09J 147/00, classification is given in the form of C-sets: the polymer in majority is given a C09J class (see below), and the minor components are characterised by Indexing Codes. The Indexing Codes are chosen from C08L or C08K and they may be linked or unlinked. The polymer in majority is always first in the C-set. Adhesive compositions based on homopolymers or copolymers of compounds corresponding to groups C08F 38/00, C08F 138/00 and C08F 238/00. After the notation of C09J 149/00, classification is given in the form of C-sets: the polymer in majority is given a C09J class (see below), and the minor components are characterised by Indexing Codes. The Indexing Codes are chosen from C08L or C08K and they may be linked or unlinked. The polymer in majority is always first in the C-set. Remark: Note 2 is not relevant for C09J 149/00. All documents from before 2003 are reclassified. a. An adhesive composition of a blend of 60 parts polyacetylene (C09J 149/00) and 40 parts polyamide (C09J 177/00) is classified in (C09J 149/00, C08L 77/00). b. An adhesive composition of a blend of 50 parts poly acetylene (C09J 149/00) and 50 parts polyamide (C09J 177/00) is classified in (C09J 149/00, C08L 77/00) and (C09J 177/00, C08L 49/00). c. An adhesive composition based on a composition of polyacetylene and containing CaCO3 is classified in C09J 149/00 and C08K 3/26. If this composition contains also a polyamide, then the classification will be (C09J 149/00, C08L 77/00, C08K 3/26). d. An adhesive composition based on a composition based on a first polyacetylene (C09J 149/00) and containing a second polyacetylene, a phenol and silica is classified in (C09J 149/00, C08L 49/00, C08K 5/13, C08K 3/36) and C08L 2205/02. e. An adhesive composition on a composition containing a polyamide in majority, a polyester and a polyacetylene is classified in (C09J 177/00, C08L 67/00, C08L 49/00) and C08L 2205/03. Documents are preferably classified according to the examples in the documents, not according to general claims, e.g. if the examples only describe adhesive compositions based on polyacetylene, but subject matter of the claim is an adhesive composition of polyolefin, the document is classified under adhesive compositions of polyacetylene (C09J 149/00, C08L--/--). Adhesive compositions comprising graft polymers of C08F 251/00-C08F 292/00. Graft copolymers in which the grafted component is obtained by reactions involving C=C per se are classified in C08F 251/00-C08F 292/00. Compositions (other than coating or adhesive) comprising a grafted polymer in majority and other polymer(s) are classified in C08L 51/00-C08L 51/10. Adhesive compositions comprising graft polymers in which the graft polymer is in minority are classified in C08L 51/00-C08L 51/10. For adhesive compositions comprising grafted rubbers, several classes are given if the rubber is specific. Adhesive compositions of block polymers of classes C08F 293/00-C08F 297/08. Block polymers obtained by reactions only involving C=C per se are classified in C08F 293/00-C08F 297/08. Compositions (other than coating or adhesive) comprising block polymer in majority and other polymer(s), are classified in C08L 53/00-C08L 53/025. C-sets and C08L classes are used as specified in the Special rules of classification of class C09J. Adhesive compositions comprising block polymers in which the block polymer is in minority corresponding to classes C08L 53/00-C08L 53/025 . C09J 153/005 and C09J 153/025 cover adhesive compositions comprising modified block polymers. In particular, adhesive compositions comprising hydrogenated styrene-diene block copolymers are classified in C09J 153/025. Adhesives based on polymers obtained by reactions only involving carbon-to-carbon unsaturated bonds which are not limited to a particular polymer type as defined in groups C09J 107/00-C09J 155/00. Adhesive compositions of polymers obtained by reactions only involving carbon-to-carbon unsaturated bonds which are not specific enough as to fit in the preceding groups C09J 107/00-C09J 155/00. Use of C09J 157/00-C09J 157/12 classes should be avoided by classifying the specific examples, whenever practicable, in the corresponding classes of C09J 107/00-C09J 155/00. Adhesives based on polyacetals, which are addition polymers of aldehydes or cyclic oligomers thereof or of ketones and correspond to groups C08G 2/00 - C08G 16/00 and their subgroups. Attention is drawn to the rules of classification with C-sets which are explained after the C09J title. When a document specifies and adhesive based on polyacetal in general, or both homopolyacetals and copolyacetals, then main group C09J 159/00 is used; only when the document specifically mentions homopolyacetals or copolyacetals, then C09J 159/02 and C09J 159/04 respectively are used. aldehydes or ketones with only compounds containing hydrogen attached to nitrogen which correspond to subgroups C08G 12/00. IPC groups C09J161/08 and C09J161/10 are not used and covered by C09J 161/06. Attention is drawn to the rules of classifying with C-Sets which are explained after the C09J title. Adhesive compositions based on polycondensates having more than one epoxy group per molecules, with or without other components. C08L 63/00 relates to compositions based on epoxy resins. C09D 163/00 relates to coating compositions based on epoxy resins. Therefore at least one Indexing Code must always be present when more than one polymer is mentioned (see Notes 2 and 3 after C09J title). a. An adhesive composition comprising a blend of 60 parts non-specified epoxy resin (C08J163/00) and 40 parts polyamide (C09J 177/00) is classified in (C08J163/00, C08L 77/00). a': An adhesive composition comprising a blend of 50 parts non-specified epoxy resin (C08J163/00) and 50 parts Novolak epoxy resin (C09J 163/04) is classified in (C08J163/00, C08L 63/04), (C08J163/04, C08L 63/00) and C08L 2205/02. contains also a polyamide, then the classification will be (C08J163/00, C08L 77/00, C08K 3/26). Adhesive compositions comprising aromatic epoxy resins, which are multifunctional (three functions or more per molecule), from the condensation of phenol-formaldehyde resins and epichlorhydrin. Adhesive compositions comprising cyclic heteroaromatic resin with three glycidyl groups: from the reaction of cyanuric acid with excess epichlorhydrin. Adhesives and adhesive processes (but see below for adhesive processes) based on macromolecular compounds obtained by reactions forming a carbon-carbon bond in the main chain other than polymers obtained by reactions only involving the polyaddition of carbon-to-carbon unsaturated bonds (wherein in the latter case the reactive carbon-carbon group stays intact without cleavage of fragments). Said macromolecular compounds are themselves classified in C08G 61/00-C08G 61/127. The use of such materials as adhesives. Macromolecular compounds per se obtained by polyaddition reactions only involving carbon-to-carbon unsaturated bonds wherein the reactive carbon-carbon group stays intact without cleavage of fragments are classified in C08F. Compositions based on monomers of such polymers are also classified in C08F. This main group includes metathesis polymerization products, but it does not include common addition polymers such as polymethylmethacrylate. Macromolecular compounds obtained by reactions forming a carbon-carbon bond in the main chain other than polymers obtained by reactions only involving the polyaddition of carbon-to-carbon unsaturated bonds are classified in C08G 61/00. Compositions based on monomers of such polymers are also placed in C08G 61/00. Coating compositions and other polymer compositions for similar uses, e.g. paints, inks, woodstains and printing pastes, are classified in C09D. Adhesives based on polymers prepared by condensation reactions of aldehydes or ketones with phenols only are classified in groups C09J 161/04 - C09J 161/16, since C09J 161/00-C09J 161/34 take precedence. For the same reasons, adhesives based on condensation polymers of aldehydes or ketones only are classified in C09J 161/02. Adhesives of polymers, which may otherwise be formed by carbon-carbon bond formation, but which are prepared by condensation reactions other than those involving the formation of carbon-carbon bonds in the main chain are classified in the appropriate groups, e.g. C09J 179/04 for adhesives based on polypyrrole formed from amines and polyketones. Polyketone-based adhesives are classified in C09J 173/00. See pertinent explanations provided at the subclass level, relating to classification rules applying to C09J in general. These principles also apply here. An addition polymer is a polymer which is formed by an addition reaction (polyaddition), where monomers bond together via rearrangement of bonds without the loss of any atom or molecule. This is in contrast to a condensation polymer which is formed by a condensation reaction where a molecule, such as water, is lost during the formation. Condensation polymers are macromolecules formed my means of reactions in which water or some other simple molecule is eliminated from 2 or more monomer molecules as they combine to form the polymer (polycondensation). Adhesive compositions wherein the major component is a polymer of C08G 63/00. Same rules apply as for C08L 71/00 - C08L 71/14. The same rules as for C08L 73/00 - C08L 73/02 apply. Adhesive compositions of polymers of C08G 18/00 or C08G 71/00. The presence and nature of further polymers in the adhesive composition is indicated by using a C-Set, see the Special Rules after the title of C09J. The polymer components present in minority are indicated using additional Indexing Code-codes C08L for each minority polymer. polyamines and polycarboxylic acids which correspond to subgroup C08G 69/26, e.g. nylon 66. Attention is drawn to the rules of C-sets which are explained after the C09J title. Group C09J 177/10 takes precedence over C09J 177/02, C09J 177/04 and C09J 177/06. Polycondensates having nitrogen-containing heterocyclic rings in the main chain, e.g. polyhydrazides, polyhydrazides, polytriazoles, polyamino-triazoles, polybenzimidazoles or polyoxadiazoles. Polyimides, polyester-imides, polyamide-imides, polyamide acids, (unsaturated) polyimide precursors. Same rules as for C08L 81/00-C08L 81/10 apply. Adhesive compositions of macromolecular compounds obtained by reactions forming in the main chain of the macromolecule a linkage containing silicon with or without sulfur, nitrogen, oxygen or carbon only, e.g. Adhesive compositions of derivatives of such polymers . These polymers are referred to with the MDTQ nomenclature. Adhesive compositions made form mixtures of different reactive silanes (sol-gel compositions) are classified in the respective subclass of C09J 183/00. It is assumed that in such mixtures there has always been formed a siloxane polymer via hydrolysis/condensation. The classes for adhesive compositions are structured in analogy to the coating compositions C09D 183/00. All notes in C09D 183/00 apply for C09J 183/00. From 01.09.2010 onwards, an adhesive composition containing two or more siloxanes is searched and classified in (C09J 183/04, C08L 83/04), and then given additional Indexing Codes for the respective siloxanes, e.g. C08G 77/12 for Si-H siloxane and C08G 77/20 for vinyl-siloxane. Attention is drawn to the CPC Definitions of C08G 77/42. Attention is drawn to the CPC Definitions of the respective C08G 77/00 classes. C09J 183/10 takes precedence over this group. Adhesive compositions based on macromolecular compounds corresponding to groups C08G 79/00, e.g. containing Al or Sn. The same rules as for C08L 85/00-C08L 85/04 apply. Adhesive compositions of unspecific macromolecular compounds, obtained by step polymerisation reactions or addition polymerization reactions. Adhesives based on proteins or derivatives thereof corresponding to the following groups: C08H 1/00-C08H 1/06. Covalently or ionically crosslinked gels are classified in C08H as they are considered as protein derivatives per se. A composition based on proteins or derivatives thereof is classified in C08L. Coating compositions based on proteins or derivatives thereof are classified in C09D following the same rules as mentioned in the note for C08L. Please refer to the corresponding part in C08H. Adhesive compositions of proteins or derivatives thereof in solution, together with other macromolecular compounds, or together with an inorganic or non-macromolecular organic additive are considered as an adhesive composition and are thus classified according to the rules of C09J. They are classified according to the mutual proportions by weight of only the macromolecular constituents, in particular according to the macromolecular constituent present in the highest proportion. If all the constituents are present in equal proportions, the composition is classified according to each of these constituents. Compositions containing an adhesive composition of proteins or derivatives thereof and an inorganic or non-macromolecular organic additive as compounding agent are not classified in C08K , but in the C09J subclass together with the corresponding Indexing Code(s) in C08K. Example: An adhesive composition consisting of gelatine and glass fibres (filler) is classified in C09J 189/06 and C08K 7/14. Last place priority rule: Within each sub group of this group, in the absence of an indication to the contrary, classification is made in the last appropriate place. Adhesive compositions based on drying oils, vulcanised oils, e.g. factice, linoxyn or (mineral) waxes. A composition based on oils, fats, waxes or derivatives thereof is classified in C08L. Coating compositions based on oils, fats, waxes or derivatives thereof are classified in C09D following the same rules as mentioned in the note for C08L. The use of oils, fats and waxes in cosmetics and other toilet preparations is further classified in one of A61Q together with A61K 8/92. Galenical compositions comprising natural resins are classified in A61K 9/00. The use of oils, fats and waxes as carriers in medicinal preparations is classified in A61K 47/44. The use of oils, fats and waxes in lubricants is classified in C10M. Oils, fats and waxes in solution, or together with other macromolecular compounds, or together with an inorganic or non-macromolecular organic additive are considered as a composition and are thus classified according to the rules of C09J. They are classified according to the mutual proportions by weight of only the macromolecular constituents, in particular according to the macromolecular constituent present in the highest proportion. If all the constituents are present in equal proportions, the composition is classified according to each of these constituents. Compositions containing oils, fats and waxes and an inorganic or non-macromolecular organic additive as compounding agent are not classified in C08K, but in the C09J subclass together with the corresponding Indexing Code(s) in C08K. A composition based on natural resins or their derivatives is classified in C08L. Coating compositions based on natural resins or their derivatives are classified in C09D following the same rules as mentioned in the note for C08L. Grafted natural resins obtained by reaction of an unsaturated monomer onto a natural resin are classified in C08F 253/00. Please refer also to the corresponding part in C09F 1/00. Adhesive compositions based on natural resins in solution, or together with other macromolecular compounds, or together with an inorganic or non-macromolecular organic additive are considered as a composition and are thus classified according to the rules of C09J. They are classified according to the mutual proportions by weight of only the macromolecular constituents, in particular according to the macromolecular constituent present in the highest proportion. If all the constituents are present in equal proportions, the composition is classified according to each of these constituents. Adhesive compositions containing a natural resin and an inorganic or non-macromolecular organic additive as compounding agent are not classified in C08K , but in the C09J subclass together with the corresponding Indexing Code(s) in C08K. Compositions of bitumen or asphalt used for adhesive applications other than adhering aggregate. Aqueous compositions of bitumen or asphalt, e.g. emulsions, used for adhesive applications other than adhering aggregate. Since the main group C09J 195/00 is seen as a "related field" of C08L 95/00, explicit reference is made to all references, definitions, terms and rules explained in said main group C08L 95/00. The subgroup C09J 195/00 or C09J 195/005 should be used only if the claims of the application explicitly encompass a bituminous adhesive as such. In addition a C08L 95/00 code in combination with the relevant Indexing Code(s) (C08L 2555/00 - C08L 2555/86) characterising essential features should also be given if the adhesive composition is mainly characterised by the bituminous composition, either by its constituents and/or by its parameters. Covalently or ionically crosslinked gels are classified in C08H as they are considered as protein derivatives per se . Lignin-containing adhesive compositions in solution, together with other macromolecular compounds, or together with an inorganic or non-macromolecular organic additive are considered as a composition and are thus classified according to the rules of C09J. They are classified according to the mutual proportions by weight of only the macromolecular constituents, in particular according to the macromolecular constituent present in the highest proportion. If all the constituents are present in equal proportions, the composition is classified according to each of these constituents. Adhesive compositions containing a lignin-containing material and an inorganic or non-macromolecular organic additive as compounding agent are not classified in C08K, but in the C09J subclass together with the corresponding Indexing Code(s) in C08K. Adhesive composition of natural macromolecular materials in solution, or together with other macromolecular compounds, or together with an inorganic or non-macromolecular organic additive are considered as a composition and are thus classified according to the rules of C09J. They are classified according to the mutual proportions by weight of only the macromolecular constituents, in particular according to the macromolecular constituent present in the highest proportion. If all the constituents are present in equal proportions, the composition is classified according to each of these constituents. Adhesive compositions containing a natural macromolecular material and an inorganic or non-macromolecular organic additive as compounding agent are not classified in C08K, but in the C09J subclass together with the corresponding Indexing Code(s) in C08K. Adhesive compositions based on unspecified polymers.